A reader filed a Freedom of Information Request for food receipts where charges were listed without explanation. He filed for what showed on the statement approved for payment at the April 27th Council meeting. Keep in mind, all the PCard charges used to reflect dates and who the meal was with. Changing how the charges are listed shows the City is transparent in name only. If they don’t like filling FOIA requests, go back to how charges used to be reflected. Some receipts show Bloomington taxpayers paid for multiple meals, some don’t. I listed who the meal was with for information purposes. Tari was in Washington DC on March 6th, evidently Mike Matejka was with him. Michael Raikes is also a union guy. Posted in BloNo, Bloomington, Hales, Local, Renner, Taxes.Tagged BLOOMINGTON CITY COUNCIL, Hales, OCard purchases, Renner. I call these people “PIGS”. All of them earn a pretty good salary and can pay for their own meal. I am reminded by a quote from the movie History of the World Part 1…….”Its good to be the king”. For crying out loud Hales can’t buy his own lunch? Has this been mentioned before: The IRS should take a look at these individuals’ tax returns. It could be strongly argued that some of these meals are not being provided by the employer for the sake of the employer’s convenience. Therefore, these amounts should be included on the return as income. The IRS has a toll free (800) fraud hotline. The IRS has very particular rules regarding income tax evasion through employee perks. Go for it! We’ve got years of history. Wow, I like that idea, contact the IRS. I bet they have gotten by without reporting the meals on their taxes. I like it. They don’t account to us, the taxpayers, what is discussed at the business meals. For all we know, they are just socializing on our dime. Also, take home vehicles. Hales has a take home city vehicle, so do a few others. The miles from home to work and from work to home, plus any other personal miles must be reported to the IRS at the end of the year ( Total mileage x Government $ per mile) as additional income on the employees W2. I wonder if the City is doing that? Hales does not have a take home city vehicle. He does get a vehicle allowance somewhere around 500 bucks a month though, which is ridiculous. then I stand corrected. Thank you Hoover . Yes, they can pay for their own meals. They ‘choose’ not to and that reveals just how much they care to save this City money. Perhaps if they had to use their own money they would eat a bit more sensibly. How many of their constituents can afford to eat like this every month? All day BUDGET meeting breakfast and lunch costs $46.71 each. That is almost worse. Still outrageous. City Council Committee of the Whole: Light dinner available at 5:00 p.m.
Allright, I’ll also try to get a field agent involved. I wonder if Tari forgot that the Mayorship is supposed to be a PART TIME position? Someone should clue him in that because it’s part time, that’s why we have the City Manager form of government with a part time Mayor as opposed to just a fulltime Mayor as outlined in the Illinois statutes. I don’t think most citizens would mind tax money being spent on business meals and travel that result in something positive being accomplished, but over the past 2 years I haven’t seen that happen at all. All I see is Renner and Hales using these taxpayer lunches to meet with their lapdog Democrat Councilmen over lunch or dinner to plan and strategize ,and to get around the Open Meetings Act. I also see them taking out the same old union pals, Town of Normal politicians, and media personalities that they have in their pocket. 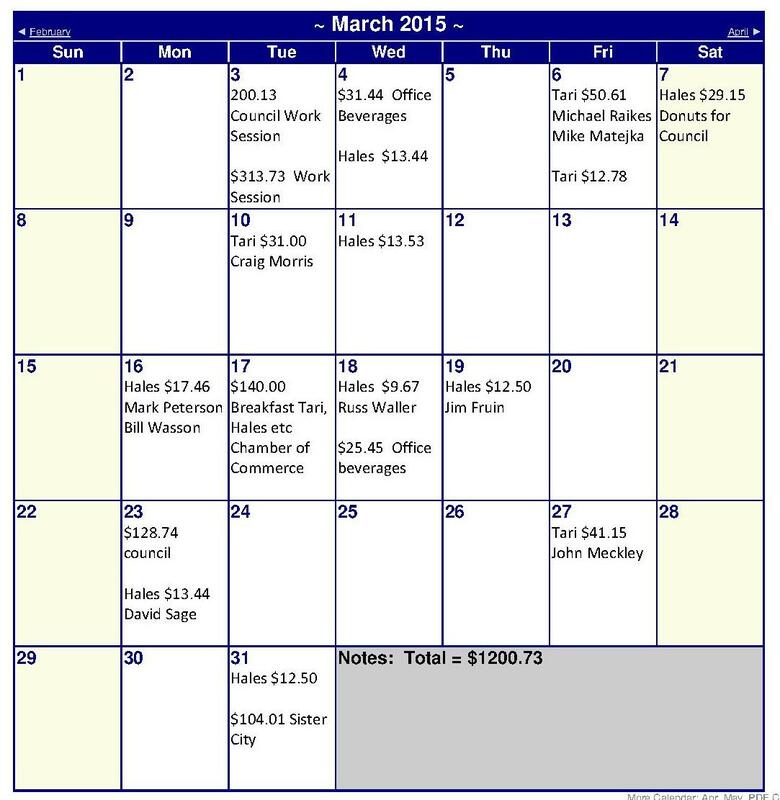 Last, is it to much to ask our officials, who work for us , to annotate the reason why and brief description of what was discussed of business meals paid for by the city? Most companies require that information on expense reports. It keeps everyone honest. After all, how do we know we are just paying for their social meal tab? I doubt Mayor Transparency would like that idea. The bird cage liner has a new article up on their trashy website about the “White Elephant” losses so far for FY 2015. $500K so far. That darn hotel is the problem LOL.